Are you starting a business and are stressing over what to name it? Or do you have a business but the name just isn’t working and you are wondering if you should change it? If so, you are not alone. Choosing a business name is an important exercise because the right name that sends the right message can have a tremendous impact on whether your customers take your business seriously, view it as a successful entity or shy away from your brand entirely. Many small business owners don’t realize the long term implications of naming and may choose a name without much thought. Not getting it right the first time can cost your business a lot of money and effort later if you have to change the name. Think of all the time you spent on creating brand visibility that is now wasted and how much more you need to invest in doing it all again. I personally have gone through this exercise when I renamed my business from Vista Consulting to Masterful Marketing and although my transition was not that painful, I have seen others that truly were. Luckily for me, the switch was relatively painless and happened long before my business was thoroughly entrenched in social media. If the name you originally chose is not the right fit for your business (as was mine) and is causing confusion about what you do, you should make the move to a name that helps to simplify your marketing. The process takes planning and execution, but in the long run, choosing a business name that projects the right image is more than worth the effort. If you need to change your business name because the one you have is not working, assess the areas that will be impacted by the change and have a plan to address those changes before you begin the process. What about your business filing with your state if you are incorporated? Do you need to submit a name modification? What about your town? Do you need to change your domain name and your email? How about social media? Changing your Facebook business page name, Google+ page name, LinkedIn company name could be problematic. Do you need to research and update directory listings? If you are a local business, how much time will you spend claiming all the business listings, changing the name and verifying that you are the business owner? Do you need to change or modify your logo, website design, brochures and business cards? Is the name change significant enough to make the cost to change worth it? 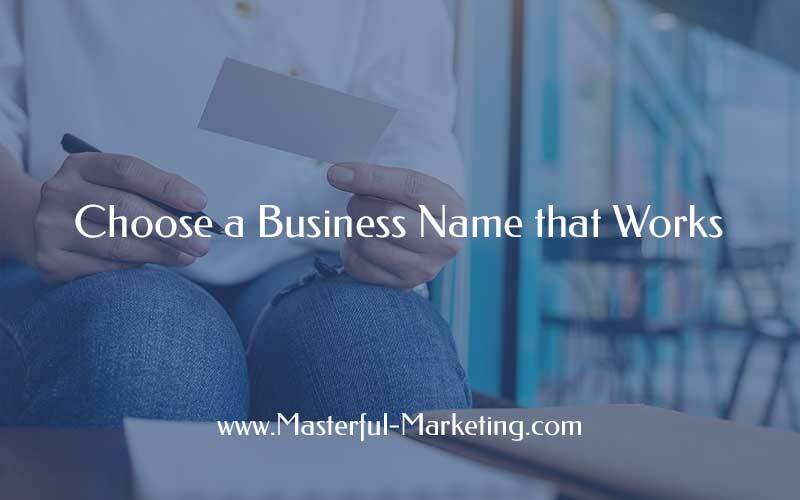 Many small business owners handle this exercise by either picking a name without much thought or using something they like but doesn’t offer the benefits of a really descriptive name. If you are not sure what would be a good name for your business, go through this exercise. What are your goals for this name? Set the ground rules of what image you want to project. Then create a list of adjectives that describe your business. List terms such as strength, expertise, playfulness, energetic or flexible. Choose a word that describes what your business does such as marketing, consulting, electrician or remodeling. Take the word that your business does and combine it with the adjectives you chose. Examples could be “agile remodeling” or “energetic healing”. These word combinations may not be the exact name for your business, but they can lead you in the right direction. Use that theme to come up with a list of potential names. Spend some time searching for synonyms to the adjectives you chose to describe your business. Sometimes the work combination comes easily. Other times not so. Don’t give up and don’t rush the process. Once you come up with a list of viable names, make sure you check to see if they are available – search for the domain name and check with the US Patent and Trademark Office to see if it is trademarked. Then search for the name in Google to see how it has been used. Given other ways the phrase is used, you may not want to use it for your business name. Stay away from names that are so generic that it makes it hard to differentiate you. Go to Google and search for “Computer Services, Inc.”. With 440 million results, do you think you’ll ever rise to the first page? Avoid names that can really date your business. As with everything, there are naming trends that will go out of style. Avoid industry jargon in your names. If your clients are outside your industry, they won’t get it and you are back to explaining what you do. Choose a name that is descriptive enough to help people understand what you do but also gives you some flexibility to expand your offerings in the future within your respective niche. If you want to expand to an entirely different area, start a new business – it will be easier to brand and market! Avoid names that don’t clearly relate to your line of business as they may cause confusion with clients and probably won’t show up in Internet searches for your type of product or service. Combine real words in a way that is catchy and can be easily branded. If you can include something descriptive as well, you’ve hit the jackpot. Besides making the name memorable, the combined words may make it easier to trademark and get the domain name. Make sure the name is easy to pronounce, is pleasing to the ear and easy to spell. If you are a global business, make sure the name you choose is not offensive to any culture or translates into a negative word or slang in another language. Keep the name as simple as possible – one-word names are the best, two word names are fine. Three short words if you must. Avoid initials as they are meaningless and boring. Big brands who have spent millions on branding can adjust (such as IBM and CVS), but a small business with minimal dollars doesn’t have the same advantage. If you want to someday sell your business, avoid using your name as the business name. If you don’t think you will, that may be an option but again, decide whether you are your business or you want something else to brand. (I’ve actually done both with Masterful Marketing!) Either works but that is up to you and what you are trying to accomplish. Coming up with an appropriate name and getting the domain name to match is a challenge, but with some thought, brainstorming, and creative thinking, you can create a short, catchy name and a domain name that works and can be trademarked. Getting it right from the beginning makes building awareness and brand recognition more effective. Don’t get discouraged. You will arrive at a name that can become a great brand. What is your business name and why did you make the choice you did? Great article, thank you for very useful tips. I was wondering if i could advise if we could use word ‘quirky’ in the brand name – in the creative jargon is has positive meaning I’m just not sure if that could work in general. we think of adding another noun after it so it has 2 words. We invent new products and produce them, from daily use products eg kitchen stuff to made on order 3d desigs fully customised. Hi Darius – if you can test the name with your target audience before you invest in a lot of branding, that would be the best possible route to take. Naming is one of those things that can cost a lot in time and resources if what you pick turns doesn’t resonate with them and can actually turn off your target audience. Best to see if you can get some data from those who you are trying to attract. I stumbled upon your article while searching for a good business name. Business is very crucial because this will be your business identity. You said “If you want to someday sell your business, avoid using your name as the business name.”, what about name Initials? My friends (James, Jessica) and I were planning to create a shirt business and I was thinking like “Double J & L Co.” or “Lucky JJL Shirts” since my friend wants it simple and for people to easy to remember. We might not sell only shirts but other accessories too. Hi Lily – Using initials are OK. I actually switched a client’s business name from his name to his initials for that reason. The key is to think it through before you file and buy a domain name – rebranding is more difficult than getting it right the first time. Good luck on your business endeavor. Hi I am in the process of starting a online travel website. I have great products to sell but don’t have a buisness plan in place. The company is called Handpicked Tours which there ars many companies with similar names. What can your company offer to help me in my new venture? Hi Nellie, my services are marketing coaching which includes strategy through implementation mentoring so you can successfully marketing your business and gain visibility. If you are interested in finding out more, please send me a message through the contact form and we can set up a brief call to discuss how I can help. Thanks for asking! I am starting a construction company that flips homes, does remodeling and will grow into new construction homes within the first year. I was thinking First Choice Homes. Does this resonate for remodeling or does it sound like just new homes? I could also go with First Choice Remodeling but that hurts future growth. My slogan is: Building the future. Restoring the past. These are really good questions that should be asked before you start your company. Is First Choice Homes available? Both to register with the state and domain? It does sound more sales (broker) than construction. First Choice Remodeling is a good name for remodeling – although I don’t think it will limit your business and many people do search for a remodeler. What about First Choice Construction? or First Choice Construction & Remodeling? Most of my clients that do new home construction call themselves construction and then break off a remodeling “division” to market that area. Naming is hard especially when you have a broader area of expertise. Thank you Param. Good luck on choosing the name for your Internet marketing company. Great article! I know many individuals that struggle with naming their business. I started out 10 years ago as Blissful Living, moved it to High Performance Speaking and now my brand is 6-Figure Irresistible Speaking. I absolutely think you article will help others get it right the first time! Thank you AmondaRose – I’m glad you liked it. Naming is so important but people mostly give it a passing thought. Thanks a lot for your answer and your tips!I’ll follow scrupulously! great article, thanks for sharing!Your website is the best marketing advice that I have ever found. We have just launched our small 3D printing design business with the aim to catch customers between not professional users of this awesome technology that is becoming more and more reliable. The name will work just fine if you consistently project the same message everywhere so people get to know what you are all about. You got the domain, kept the name easy to understand, pronounce and remember.